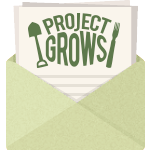 Project GROWS is committed to ensuring access to nutritious local produce for individuals and families in our area. Project GROWS partners with the Blue Ridge Area Food Bank, the Valley Mission, and other local food pantries to bring fresh, local produce to families throughout the Central Shenandoah Valley. Organizations interested in partnering with Project GROWS to receive produce donations should contact our Farm Manager, Laura Smith. Interested in Produce Donations for Your Organization?